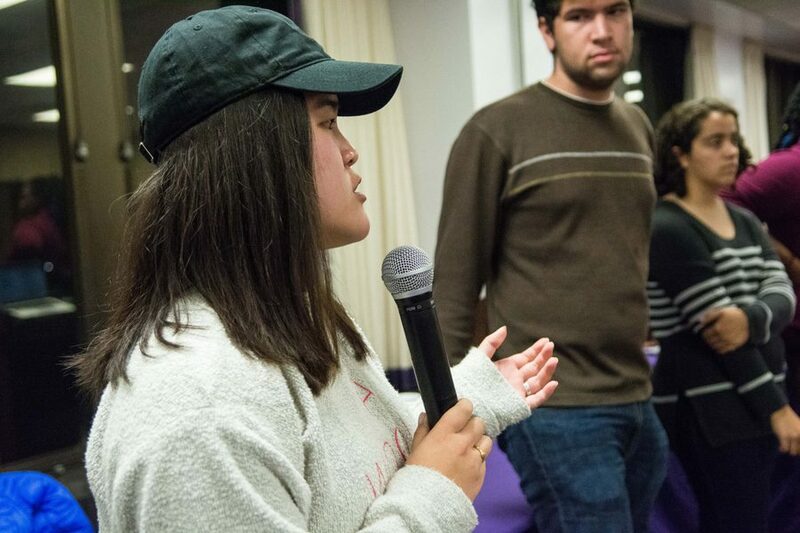 Justine Kim speaks at ASG Senate last week. Kim is a member of the Judicial Branch Reform Committee, which will do research to help determine if ASG will create a judicial branch. Associated Student Government’s internal judicial branch, if approved by a committee formed last week, would help keep members accountable for their actions, ASG President Christina Cilento said. The Judicial Branch Reform Committee, which was formed Wednesday after Senate unanimously passed a resolution, is responsible for researching judicial branches in other universities’ student governments and presenting its findings later in the school year. Its findings will help determine whether ASG will create its own judicial branch. Cilento said conversation on the subject first began last Spring Quarter during her own impeachment hearing, when Cilento and executive vice president Macs Vinson were found guilty of violating election guidelines. Cilento and Vinson were required to give written and verbal apologies as punishment, and Cilento was also required to perform 10 hours of community service. She said the unprecedented situation made it clear the Rules Committee — which currently functions as ASG’s judicial branch — wasn’t “fully equipped” to handle impeachment cases, prompting members of Senate to propose the idea of a judicial branch. Weinberg senior Joji Syed and Weinberg junior Archit Baskaran, who ran for ASG president and executive vice president last year, had included the creation of a judicial branch as part of their campaign platform. They proposed a council that would serve as ASG’s highest court and a hearing panel addressing student conduct. Cilento said the key difference between ASG’s current efforts and Syed and Baskaran’s platform is the role a potential judicial branch would play on Northwestern’s campus. She said it would serve as an internal mechanism to keep ASG accountable and would not apply to any student conduct cases. Syed and Baskaran’s platform did include addressing student conduct violations as one of the potential judicial branch’s functions. During last week’s Senate meeting, Kim said re-examining ASG’s Code and constitution should be a priority of the committee. She said a clearer understanding of both documents would help clarify how to go about re-creating or reforming ASG’s current judicial process.